Happy birthday to me, myself and I…. March 11 2019! Happy birthday to me, myself and I.... March 11 2019! Le kanji du treizième jour du mois, c’est le chuchotement , et celui pour le huitième mois, c’est l’étoile. Le kanji de du troisième jour du mois, c’est les larmes, et celui pour le premier mois, c’est la lune. Le kanji du dixième jour du mois, c’est la lumière, et celui pour le dixième mois, c’est le mot, ombres. funny senryu rigolo – Peach is 2 = Peach a 2 ans LOL! how fetching, you old crow! Who the hell is Peach? Que c’est beau, vieux corbeau ! Happy Third Anniversary to Linear B, Knossos & Mycenae! Linear B, Knossos & Mycenae was founded in March 2013, and since then it has grown to become the premier Linear B blog on the entire Internet. Our blog covers every conceivable aspect of research into Mycenaean Linear B, including, but not exclusively, decipherment of hundreds of tablets from every single sector of the Minoan/Mycenaean economy (agriculture, military, textiles, spices & condiments, vessels and pottery and the religious sector); the translation of the introduction to Book II of the Iliad, plus the entire Catalogue of Ships in Book II, with particular emphasis on the extensive influence of Mycenaean Linear B and of he Mycenaean world on the Catalogue of Ships; extensive vocabulary, lexicons and glossaries of Linear B; lessons in Linear B; progressive grammar of Linear B; extensive research into the 3,500 Scripta Minoa tablets from Knossos; and above all other considerations, the isolation, classification and decipherment of all 35+ supersyllabograms in every sector of the Minoan/Mycenaen economy (see above). Supersyllabograms were previously and erroneously referred to as “adjuncts” in Mycenaean Linear B. The decipherment of supersyllabograms is the major development of the further decipherment of Linear B since the genius, Michael Ventris, first deciphered it in 1952. But that is not all. Our blog also zeroes in on Minoan Linear A, with at least one successful attempt at deciphering at least one word on a major Linear A tablet, and that is the Linear A word for “tripod”, a truly serendipitous development, given that the same word was the first word ever translated in Mycenaean Linear B. Our blog also focuses on Arcado-Cypriot Linear C, with a few translations of tablets in that script. In short, no other blog on the Internet deals as extensively with all three of these scripts, Linear A, Linear B and Linear C together. It is also remarkable that we have had in excess of 80,000 visitors since our blog’s inception in March 2013. While this figure may seem rather smallish to many visitors, may I remind you that Minoan Linear A, Mycenaean Linear B and Arcado-Cypriot Linear C are extremely esoteric in the field of ancient linguistics. To put it another way, how many people in the entire world do you imagine can read Mycenaean Linear B, and even fewer who can read Arcado-Cypriot Linear C? Scarcely more than a very few thousand out of a population of 7+ billion. So I believe that we have made great strides in the past three years, and I fully expect that we shall top 100,000 visitors by the end of this year, 2016.
reaches its second anniversary on May 1 2015. What have we accomplished in the past two years? A great deal indeed. Here are the highlights. 1. The discovery, extrapolation, collation and classification of supersyllabograms in Mycenaean Linear B, of which there are 34 (to date) out of 61 syllabograms in Linear B, excluding counting homophones (with the sole exception of RAI = saffron). WE STRONGLY RECOMMEND THIS BLOG, AND URGE YOU ALL TO FOLLOW THE IMPRESSIVE RESEARCH CONDUCTED BY KORYVANTES. 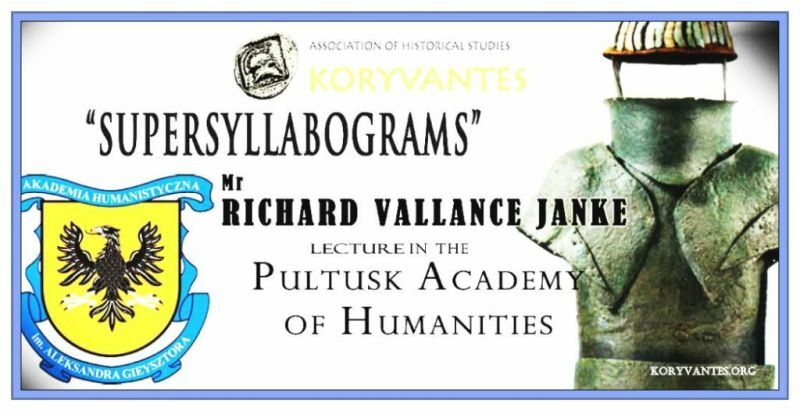 at the Pultusk Academy of the Humanities, just outside of Warsaw. His talk, and those of all other presenters at the Conference will be published by the University of Warsaw. The University of Warsaw also plans to publish the General of Supersyllabograms and its application to the translation of some 700+ Mycenaean Linear B tablets across the board, in a book to be titled, The Decipherment of Supersyllabograms in Mycenaean Linear B, to appear sometime in 2016. 4. In the past two years, Richard and his research colleague, Rita Roberts of Crete, have translated in excess of 100 Linear B tablets, most of them from Knossos, along with some from Pylos, Mycenae and Thebes. 5.2 the table of adjectives and nouns ending in the archaic “eus” in the nominative singular. 5.3 Richard plans to continue with the compilation of Mycenaean Greek grammar throughout the remainder of 2015 and into 2016. 6. Richard has translated most of The Catalogue of Ships from Book II of the Iliad by Homer, and will finish off his translation this year (2015). This will be followed by his translation of Book I of the Iliad in its entirety (2015-2016). 7. We are in the process of compiling the largest Lexicon of both attested and derived Mycenaean Greek in Linear B ever to have appeared anywhere, in print or on the Internet. We have already finished with the draft of the first Section on Military Affairs, which is to appear on our blog and on the blog of The Association of Historical Studies, Koryvantes (Athens, Greece) sometime in the summer or autumn 2015. It is to be subdivided into several primary Sections, (1) Agriculture (2) Crafts, Trade and Commerce (3) Military Affairs (4) Domestic Affairs, including the production of vessels and pottery & (5) Religious  Affairs. This is such a huge undertaking that it is unlikely that we will be able to complete it before 2018. 8. Richard has offered his services as Professor to Rita Roberts, Crete, who is now in her first year of university, working towards her three-year Bachelor of Arts in Linguists (BAL) in the field of Mycenaean Linear B. Both Rita and I can assure you that the curriculum is of the highest order and extremely demanding. Already, in her first semester of her first year, Rita has been tasked with the tough chore of translating several difficult Linear B tablets from Knossos on military affairs, and this is just the beginning! As far as we can tell, this online university undergraduate course, specifically focusing on Mycenaean Linear B, will be the first ever of its kind ever to have been offered worldwide. I am of course open to inviting others who are seriously committed to learn Mycenaean Linear B, but just as Rita has had to do, new students will have to first finish their secondary school level in Linear B before moving onto university studies. It took Rita two years to fulfill the requirements for a secondary school matriculation in Linear B. This and the full course of studies (secondary school and a bachelor’s degree) requires 5 full years of unstinting commitment to the mastery of Mycenaean Linear B. At the end of these five years, the student (Rita being our first) will possess the credentials to be an expert in the field. 9. We have begun posting on Arcado-Cypriot Linear C, having already translated 3 tablets in that syllabary. We have also made available for the first time ever the standard keyboard layout for Arcado-Cypriot Linear C, which you may download free at your convenience. We plan on continuing with posts on Linear C throughout 2016 & 2016, eventually tackling the famous Idalion Tablet of the 5th. Century BCE. Throughout 2015 and 2016, Arcado-Cypriot Linear C, the closest cousin dialect to Mycenaean Linear B, will play a significantly greater rôle than it presently does on our blog. Both Linear B and Linear C will be thoroughly cross-compared with the archaic grammar and vocabulary of the Catalog of Ships in Book II of the Iliad, the latter generally being considered as an indirect descendant of the Mycenaean & Arcado-Cypriot Greek dialects, at least in these two respects. This cross-comparative study will help us to properly situate the Mycenaean & Arcado-Cypriot Greek dialects in the diachronic time line of ancient Greek dialects. 10. We have begun a thorough-going investigation of the relationship between the Minoan Linear A & Mycenaean Linear B syllabaries, which are almost identical in most respects, the latter being derived from the former with other major Bronze Age scripts and alphabets, including the Phoenician and Proto-Hebrew alphabets, soon the Proto-Arabic, and any others which bear up well under comparison with Linear A & Linear B. 12. We have posted some information on Minoan Linear A, but it is not our intention to attempt to decipher this unknown language – at least for the next five years. However, certain aspects of Linear A itself are of prime importance to our concerns, especially its intimate relationship with Linear B, as well as its place in the development of ancient scripts in the context of 10. above. 13. We have begun exploring the possibilities for the application of Linear B & C to extraterrestrial communication. If this sounds wacky or even peculiar to you, think twice. NASA itself has already begun its own investigation of such intriguing prospects for Linear B and Linear C.
These are the primary concerns of our Blog, but there are others, which are intriguing to special interest groups. Our goals are ambitious but we mean to fulfill them. This makes for some 1,300 followers for us both on Twitter, a considerable number indeed, in light of the fact that the study of Linear B and the specialized interests in archaeology and similar arcane fields which Rita follows are rare birds indeed! We started up on Google + just a couple of months ago, and we already have 383 followers in our Circle. The Famous “Dolphin Fresco” at Knossos on Papyrus! Minoan Literature? Did any Exist? Religious? Military?